Mount the engine on a suitable engine stand. Refer to EM-91, "Setting". Drain any remaining engine oil and engine coolant, (if necessary). Remove drain plugs from cylinder block. Remove cylinder block heater (if equipped). Remove cylinder head. Refer to EM-54, "Exploded View". CAUTION: Carefully handle knock sensor avoiding shocks. 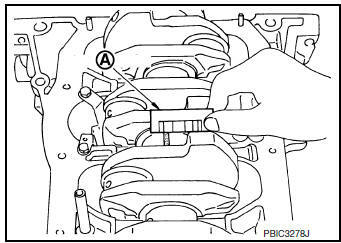 Remove crankshaft position sensor (POS) (2). Avoid impacts such as dropping. Keep crankshaft position sensor (POS) away from metal particles. 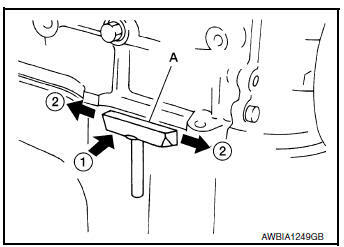 Do not place crankshaft position sensor (POS) in a location where it is exposed to magnetism. Before removing piston and connecting rod assembly, check the connecting rod side clearance. Refer to EM-100, "Inspection". Using a hammer handle or similar tool, push piston and connecting rod assembly out to cylinder head side. 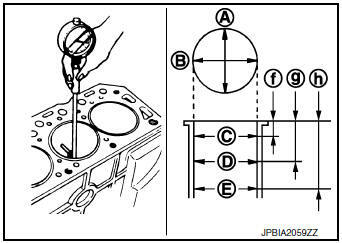 Do not damage cylinder wall and crankshaft pin, resulting from an interference of the connecting rod big end. NOTE: Number the pistons and rods so they can be installed in the same position. CAUTION: When removing them note the installation position. Keep them in the correct order. Before removing piston rings check the piston ring side clearance. Refer to EM-100, "Inspection". Remove snap rings using snap ring pliers (A). Heat piston to 60°C to 70°C (140°F to 158°F) with a heat gun (A). Push out piston pin using a suitable tool. Measure crankshaft end play before loosening lower cylinder block bolts. Refer to EM-100, "Inspection". 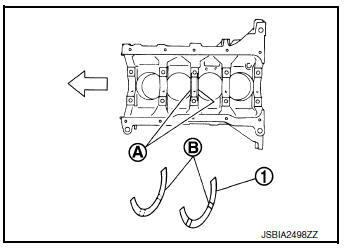 Loosen and remove lower cylinder block bolts in reverse order as shown. 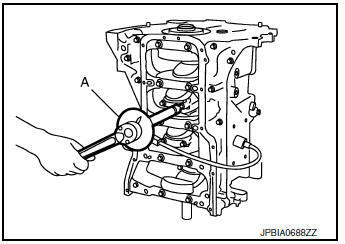 Remove the lower cylinder block using Tool (A). NOTE: In areas where the cutter is difficult to use, use a plastic hammer to lightly tap (1) the cutter where the liquid gasket is applied. Use a plastic hammer to slide (2) the cutter by tapping on the side. Remove the lower cylinder block while tapping lightly with a plastic hammer. Do not damage or deform signal plate (1) mounted on crankshaft. When setting crankshaft on a flat floor surface, use a block of wood to avoid contact between signal plate and floor surface. Do not remove signal plate unless it is necessary. Remove rear oil seal from rear end of crankshaft. CAUTION: Do not damage the crankshaft or cylinder block when removing the rear main seal. Remove main bearing (upper and lower) and thrust bearings from cylinder block and lower cylinder block. CAUTION: When removing bearings note the installation position. Keep them in the correct order. NOTE: When removing the rear oil seal without removing the cylinder block, use a suitable tool to pull it out between the crankshaft and block. Remove oil jets (1) from cylinder block. CAUTION: When removing oil jet assemblies note the installation position. Keep them in the correct order. CAUTION: Use goggles to protect your eyes. 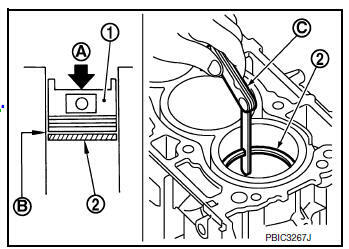 Install drain plugs to cylinder block as shown. CAUTION: Do not reuse washer (1). 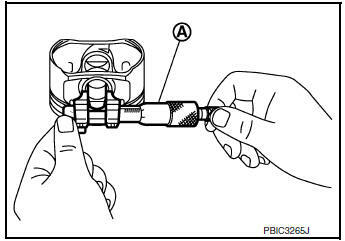 Apply liquid gasket to the threads of drain plug (3). NOTE: Do not apply liquid gasket to the thread of plug (2). Remove dust, dirt, and engine oil on the bearing mating surfaces of cylinder block and lower cylinder block. Install thrust bearings (1) to both sides of the No. 3 journal (A) housing on cylinder block. 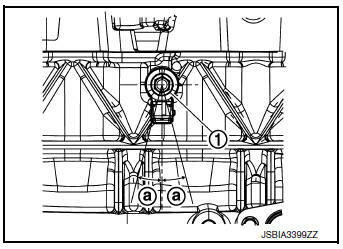 Install thrust bearings with the oil groove (B) facing crankshaft arm (outside). Main bearing with an oil hole and groove (E) goes on cylinder block. The one without them (C) goes on lower cylinder block. Only main bearing (on cylinder block) for No. 3 journal (2) has different specifications. Before installing main bearings, apply new engine oil to the bearing surface (inside). Do not apply engine oil to the back surface, but thoroughly clean it. 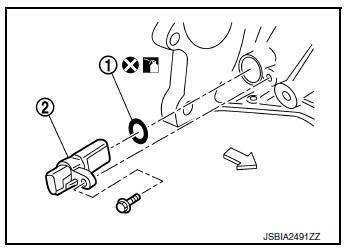 When installing, align main bearing stopper (B) to the notch. Ensure the oil holes (A) on cylinder block and those on the corresponding bearing are aligned. Install signal plate to crankshaft (if removed). Set the signal plate with flange facing toward the counterweight side (engine front side). After positioning crankshaft (2) and signal plate (1) with positioning dowl pin (A), tighten bolts. CAUTION: Be sure to remove dowel pin. CAUTION: Do not install rear oil seal yet. Apply liquid gasket with a suitable tool to lower cylinder block. 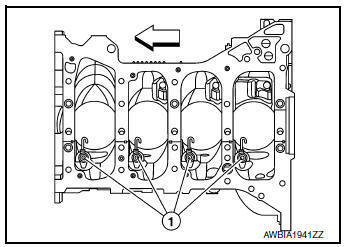 NOTE: Lower cylinder block cannot be replaced as a single part because it is machined together with cylinder block. Apply new engine oil to threads and seat surfaces of the bolts. Tighten lower cylinder block bolts to specification in the numerical order as shown. 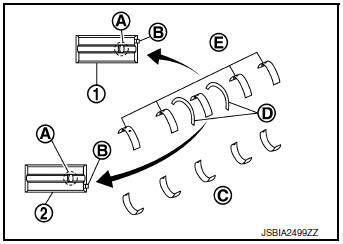 Tighten bolts to specification using suitable tool and Tool (A). CAUTION: Check tightening angle. Do not judge angle by visual inspection. Install rear oil seal. Refer to EM-79, "REAR OIL SEAL : Removal and Installation". Wipe off completely any protruding liquid gasket on front side of engine. 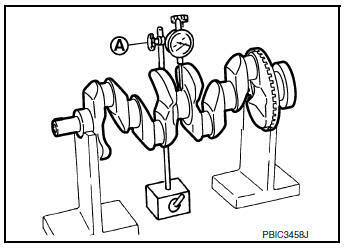 Check crankshaft end play. Refer to EM-100, "Inspection". Install new snap ring to the groove of the piston rear side using snap ring pliers. CAUTION: Do not reuse snap rings. Using a heat gun, heat piston until piston pin can be pushed in by hand without excess force [approximately 60°C to 70°C (140°F to 158°F)]. From the front to the rear, insert piston pin into piston and connecting rod. 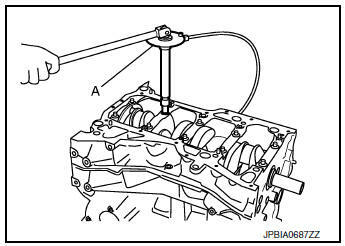 Set so that the front mark (A) on the piston head, the oil splash (B) and the cylinder number (C) on connecting rod are positioned as shown. Install piston rings using suitable tool. Position each ring with the gap as shown referring to the piston front mark (B). Install second ring with the stamped surface (E) facing upward. Do not contact rail end gap under oil ring with oil drain cast groove of piston. Install connecting rod bearings to connecting rod and connecting rod cap. When installing connecting rod bearings apply new engine oil to the bearing surface (inside). Do not apply engine oil to the back surface, but thoroughly clean it. 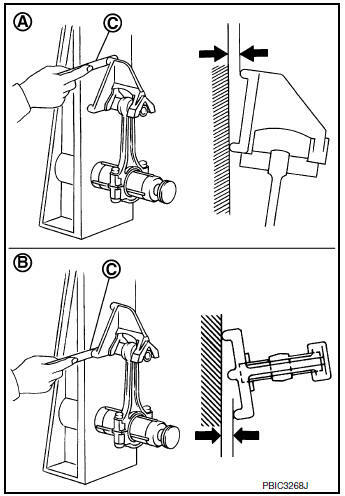 When installing, align the connecting rod bearing stopper protrusion (A) with the cutout (B) of connecting rod and connecting rod cap to install. Ensure the oil hole on connecting rod and that on the corresponding bearing are aligned. Match the cylinder position with the cylinder number on connecting rod to install. Using a suitable tool, install piston with the front mark on the piston head facing the front of the engine. CAUTION: Be careful not to damage the cylinder wall and crankshaft pin, resulting from an interference of the connecting rod big end. Match the stamped cylinder number marks on connecting rod with those on connecting rod cap to install. 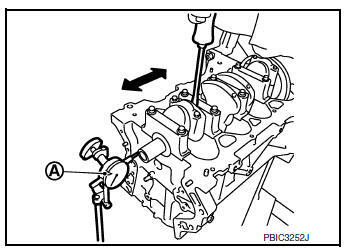 Tighten the connecting rod bolts using Tool (A) as follows: Apply engine oil to the threads and seats of the connecting rod bolts. After tightening connecting rod bolts, check that crankshaft rotates smoothly. Check the connecting rod side clearance. Refer to EM-100, "Inspection". 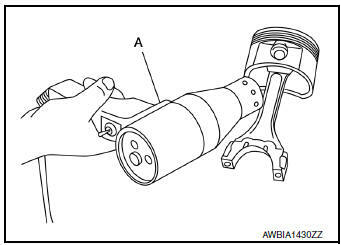 Install knock sensor with connector facing 180° +/- 15° (a) as shown. Do not tighten bolts while holding connector. 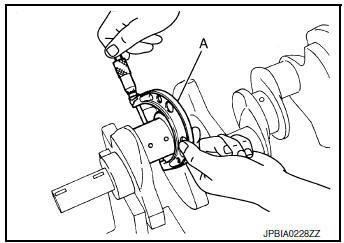 Install crankshaft position sensor (POS). Assembly of remaining components is in the reverse order of disassembly. Measure clearance between thrust bearings and crankshaft arm when crankshaft is moved fully forward or backward using suitable tool (A). Standard and Limit : Refer to EM-120, "Cylinder Block". If measured value exceeds limit replace thrust bearings and measure again. If it still exceeds limit replace crankshaft. Measure side clearance between connecting rod and crankshaft arm using suitable tool (A). If measured value exceeds limit replace connecting rod and measure again. If it still exceeds limit replace crankshaft. 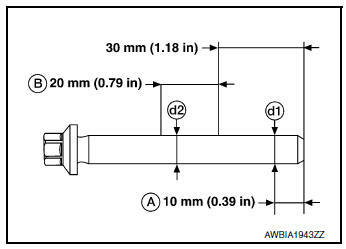 Measure inner diameter of piston pin hole using suitable tool (A). 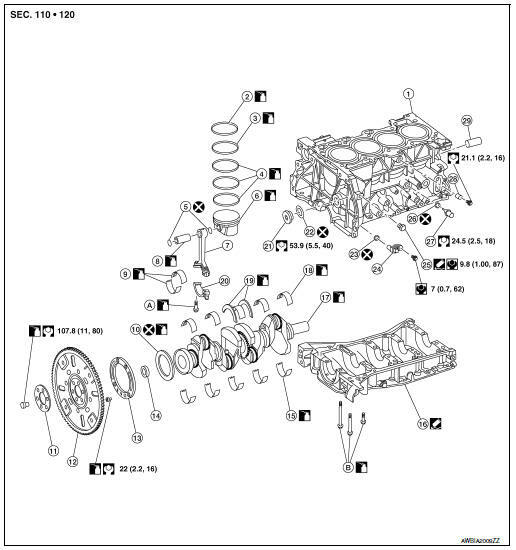 Standard : Refer to EM-120, "Cylinder Block". Measure outer diameter of piston pin using suitable tool (A). If oil clearance value exceeds the limit replace piston and piston pin assembly. 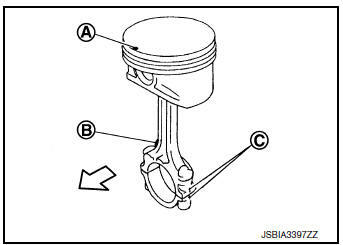 NOTE: Piston is available together with piston pin as assembly. Measure side clearance of piston ring and piston ring groove using suitable tool (A). If measured value exceeds limit replace piston ring and measure again. If value still exceeds the limit replace piston. Limit : Refer to EM-120, "Cylinder Block". If measured value exceeds limit replace connecting rod assembly. Install connecting rod cap (1) without connecting rod bearing installed and tighten connecting rod bolts. Refer to EM-93, "Disassembly and Assembly". Measure inner diameter of connecting rod big end using suitable tool. If measured value exceeds standard replace connecting rod assembly. Measure inner diameter of connecting rod bushing using suitable tool (A). If measured value exceeds standard replace connecting rod assembly and/or piston and piston pin assembly. Remove gasket on the cylinder block surface and also remove engine oil, scale, carbon and other contamination using suitable tool. CAUTION: Do not allow gasket flakes to enter engine oil or engine coolant passages. 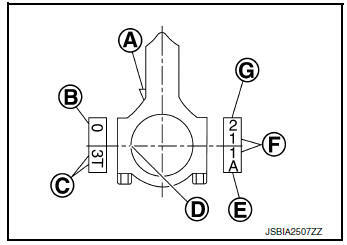 Measure distortion on cylinder block upper face at some different points in six directions using suitable tools (A/B). If measured value exceeds standard replace cylinder block. Install lower cylinder block without main bearings installed and tighten lower cylinder block bolts. Refer to EM-93, "Disassembly and Assembly". Measure inner diameter of main bearing housing using suitable tool. 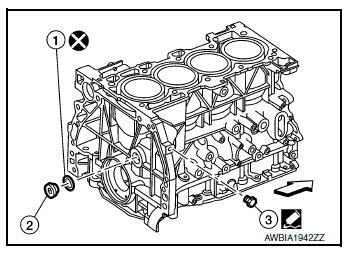 If measured value exceeds standard replace cylinder block (1) and lower cylinder block (2) assembly. 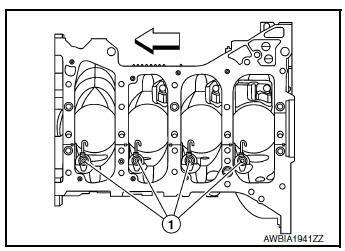 NOTE: Lower cylinder block cannot be replaced as a single unit because it is machined together with cylinder block. NOTE: When determining cylinder bore grade, measure the cylinder bore at (B) position. 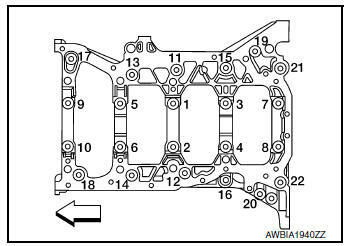 Standard: Cylinder bore inner diameter : Refer to EM-120, "Cylinder Block". Limit: Out-of-round [Difference between (A) and (B)] Taper [Difference between (C) and (D)] : Refer to EM-120, "Cylinder Block". If measured value exceeds limit or if there are scratches and/or seizure on the cylinder inner wall hone or rebore the cylinder inner wall. Measure outer diameter of piston skirt with suitable tool (A). If measured value exceeds limit replace piston and piston pin assembly.. Check that cylinder bore inner diameter is within standards. 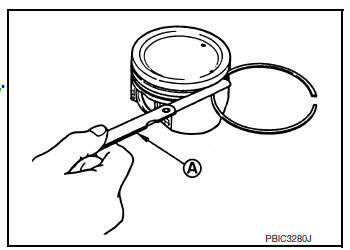 Lubricate with new engine oil to piston (1) and piston ring (2), and then insert (A) piston ring to middle of cylinder (B) with piston and measure piston ring end gap using suitable tool (C). If measured value exceeds limit replace piston ring and measure again. If it still exceeds the limit replace cylinder block. Measure outer diameter of crankshaft main journals using suitable tool (A). If measured value exceeds limit measure the main bearing oil clearance and use undersize bearing. Measure outer diameter of crankshaft pin journal using suitable tool. If measured value exceeds limit measure connecting rod bearing oil clearance and use undersize bearing. Measure dimensions at four different points as shown on each main journal and pin journal using suitable tool. Out-of-round is indicated by the difference in dimension between (a) and (b) at (c) and (d). Taper is indicated by difference in dimension between (c) and (d) at (a) and (b). If measured value exceeds limit correct or replace crankshaft. If corrected, measure bearing oil clearance of corrected main journal and/or pin journal. Then select main bearing and/or connecting rod bearing. Place V-block on precise flat table to support the journals on both ends of crankshaft. Place suitable tool (A) straight up on No. 3 journal. If measured value exceeds limit replace crankshaft. 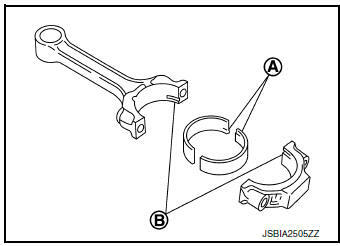 Install connecting rod bearings (2) to connecting rod (3) and connecting rod bearings cap (1) and tighten connecting rod bolts. Refer to EM-93, "Disassembly and Assembly". 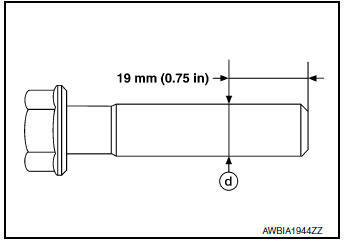 Measure inner diameter (B) of connecting rod bearing using suitable tool. Standard and Limit : Refer to EM-125, "Connecting Rod Bearing". If measured value exceeds limit select proper connecting rod bearing. 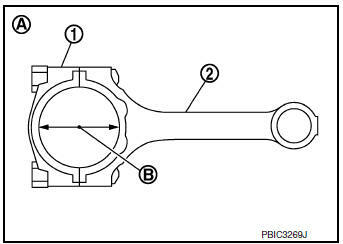 Use connecting rod big end diameter and crankshaft pin journal diameter to obtain specified bearing oil clearance. Cut plastigage slightly shorter than bearing width and place it in crankshaft axial direction avoiding oil holes. Install connecting rod bearings to connecting rod and cap and tighten connecting rod bolts. Refer to EM-93, "Disassembly and Assembly". CAUTION: Do not rotate crankshaft. Remove connecting rod cap and bearing and using the scale (A) on the plastigage bag measure the plastigage width. 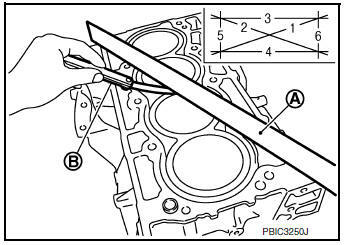 Install main bearings (3) to cylinder block (1) and lower cylinder block (2) and tighten lower cylinder block bolts. Refer to EM-93, "Disassembly and Assembly". Measure the inner diameter (B) of main bearing with bore gauge. Standard and Limit : Refer to EM-123, "Main Bearing". If measured value exceeds limit select proper main bearing. 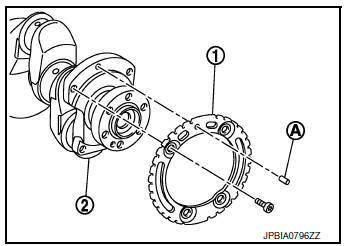 Use main bearing inner diameter and crankshaft main journal diameter to obtain specified bearing oil clearance. Remove engine oil and dust on crankshaft main journal and surfaces of each bearing completely. Install main bearings on cylinder block and lower cylinder block and tighten lower cylinder block bolts. Refer to EM-93, "Disassembly and Assembly". Remove lower cylinder block and bearings and using the scale (A) on the plastigage bag measure the plastigage width. NOTE: The procedure when measured value exceeds the limit is same as that described in “Method by Calculation”. 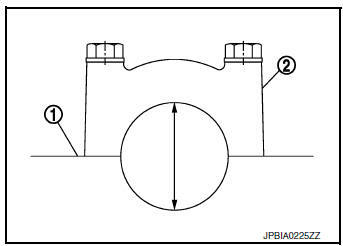 When lower cylinder block is removed after being tightened to specified torque with main bearings (1) installed, tip end of bearing must protrude (B). Refer to EM-93, "Disassembly and Assembly". Standard: There must be crush height. If standard is not met, replace main bearings. 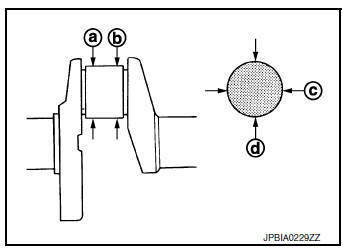 When connecting rod bearing cap is removed after being tightened to specified torque with connecting rod bearings (1) installed, tip end of bearing must protrude (B). Refer to EM-93, "Disassembly and Assembly". If standard is not met, replace connecting rod bearings. Measure outer diameters (d1) and (d2) at two positions as shown. If reduction appears in (B) range, regard it as (d2). If measured value exceeds limit (a large difference in dimensions) replace lower cylinder block bolt with new one. Measure outer diameter (d) at position as shown. If reduction appears in position other than (d), regard it as (d). If measured value exceeds limit (large difference in dimensions) replace connecting rod bolt with new one.